Construction of custom aluminum structures encompasses the largest volume of business at Daniel Aluminum Co. Universal and long-lasting, aluminum is one of the best construction materials available. Low maintenance and resistant to rust and weathering, aluminum structures are strong, safe and of the highest quality. Tired of pine needles, leaves and bugs in your swimming pool? Want some added protection against the sun's rays during summer months? 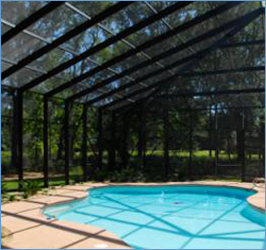 Chlorine and humidity resistant, our screened pool cages and enclosures are custom designed in-house and require highly-skilled laborers to construct onsite. One of our most labor-intensive offerings, these pool cages and enclosures typically require 2-3 weeks to complete, as there is frequently some adjustments to the house made by our qualified carpenters to make the addition a seamless fit. Daniel Aluminum Co constructs insulated sunrooms using industry proven construction materials from Superior Metal Products of Birmingham, Ala. Superior Ultra View sunrooms offer a cost-effective way to expand you home's living space. 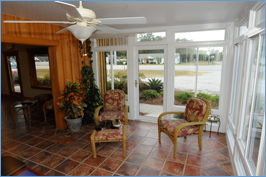 Offering a lifetime warranty on glass breakage and internal fogging, our sunrooms are constructed of baked enamel aluminum framing for low maintenance. Vinyl framed windows feature double-pane insulated and tempered glass and insulated walls and roof panels provide R-13 Thermal Resistance value for energy efficiency. Like our screened enclosures, sunrooms can be custom fit to accommodate for bay windows and other architectural features on a home. 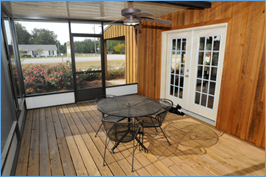 Screened porches are one of our most versatile products. They can be custom designed to fit your house, working around fireplaces and bay windows to give you the outdoor space you've longed for. These projects typically take one to three days to erect on your property, depending on the complexity of the design and any adjustments to be made to the home to ensure a seamless transition. Daniel Aluminum Company is a trusted source for quality aluminum structures, enclosures and portable products. © Daniel Aluminum Company. All rights reserved. Site Developed by Sumter's Webdesign & Hosting, LLC.